The Willie Mullins-trained Hurricane Fly produced a polished display in the BHP Insurances Irish Champion Hurdle at Leopardstown on Sunday (January 23) and has been trimmed in the betting for the English equivalent at the Cheltenham Festival in March by most firms. Sent off the 4-9 favourite for the Grade 1 contest, the son of Montjeu was always travelling extremely well and his pilot Paul Townend sat motionless in the saddle turning for home, while Davy Russell was hard at work aboard eventual runner-up Solwhit, winner of the race in 2010. Townend shook the seven-year-old up after the last flight and he readily drew clear to beat Solwhit by 3½ lengths. Mullins said: "We didn't know what the plan was going out because we were wondering if Davy Russell would make the running on his horse (Solwhit). "We weren't sure, so I think between Paul and Katie (Walsh, on Thousand Stars) they must have elected at the start what to do. "After Thousand Stars won the County Hurdle the way he did we knew he would stay well, so they elected to make the one-two from the start and it seemed to work out. "I think he'll go straight to Cheltenham now. I haven't any other plans for him. I'm delighted to get that over. It was a good performance and we'll give him a little break now before building him up again. "He can jump a bit right when there is nothing on his outside but is very slick when other horses are around him. It's our first Irish Champion Hurdle success so I'm going to enjoy it." Townend added: "It was a proper championship gallop. My lad jumped super, and I just gave him a slap after the last. He's a true professional and a proper horse." It could be argued that in winning the Irish Champion, Hurricane Fly didn’t tell us anything new. Indeed, he has beaten Solwhit in their last four meetings now, and he will face an altogether sterner test when locking horns with the likes of Binocular, Menorah and Peddlers Cross in the spring. However, it was hard not to be impressed with the gelding, as he is a slick hurdler who possesses a potent turn of foot. 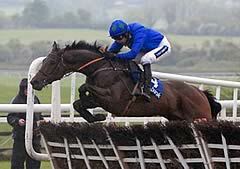 Another factor that augurs well where Hurricane Fly is concerned is his versatility in terms of underfoot conditions. Most of his racing has been on easy surfaces, but he has won on going ranging from good to firm right through to heavy. He has a fairly quick action and possesses so much natural speed, therefore if the ground is on the fast side of good at the Festival he could be seen in an even better light. I personally feel that he is the one to beat in the Stan James-sponsored event in March.